​It might well often be compulsory for your pooch to wear a muzzle when out and about, but that doesn't mean it needs to be boring! 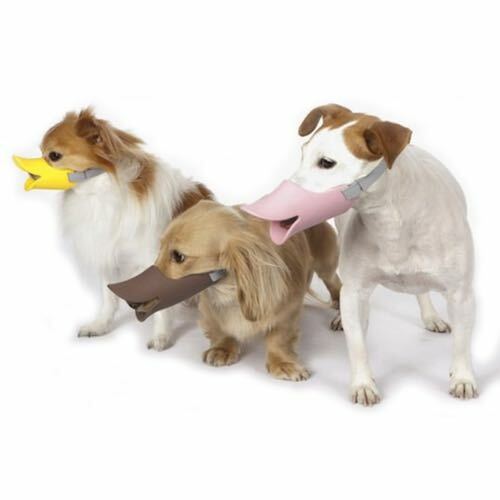 Bright, fun and with a touch of the bizarre, these Oppo Dog Muzzles will transform your familiar canine friend into a semi-duck, designer "billed" dog. A lot of overseas blogs and sites went crazy about these muzzles, with many joking that they were almost animal cruelty! Well, we have to disagree. We reckon any dog would be happy to have this funky duck bill rather than a nasty leather muzzle. They must be the most original and stylish protective pet muzzles we've seen in a while -- and that is saying a lot in Japan, where pet fashion and animal accessories are massive. There are three different sizes and three different colors (pink, yellow, brown), meaning you can match the right design for the kind of breed or personality you own.